Athens International Airport ‘Eleftherios Venizelos’, commonly initialised as AIA, is the primary international airport that serves the city of Athens, Greece. 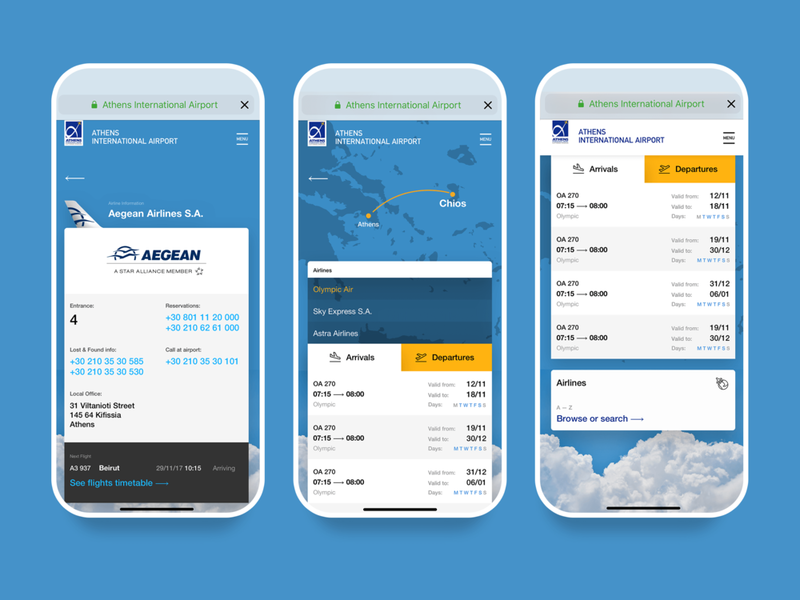 The Athens International Airport "Eleftherios Venizelos" approached the great team of We are Dope studio with the far from easy request to design and deliver the mobile version of the current website which, as launched back in May 2013, was designed only for desktop/laptop and tablet devices. Together with We are Dope, we worked on the mobile UX and UI, from wireframes to final design, during an amazing two-month turbulence-free journey. 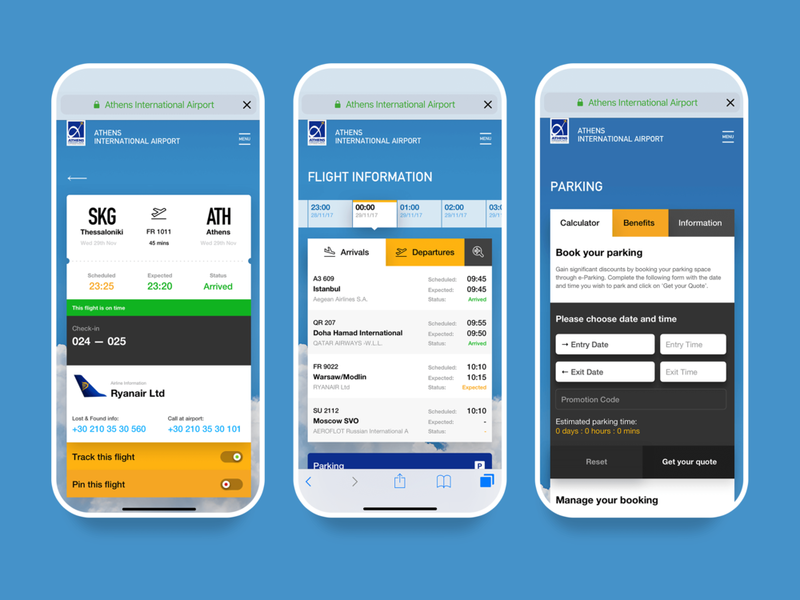 We aimed to stay consistent to AIA’s brand and art direction as it is applied on the desktop site and mobile app, while evolving the UX & UI after performing a UX audit. ¶ Complimentary, every design decision was made keeping in mind that it could be effectively applied on a potential future redesign of AIA’s digital presence. A UX Audit (review) helped us confirm we're meeting the users’ needs as well as the business goals. ¶ A great user experience comes from the users’ end, as most of them know what they want to accomplish on any given solution. Our job as designers is to help them achieve it following a clear, straightforward and pain-free experience. Any problem-solving process becomes a lot easier when it’s user informed. ¶ In this case, due to lack of time and limited access to required quantitative data, a scenario and a heuristic review was performed instead of a full-scale user testing. ¶ Additionally, we focused on qualitative data, accessibility, interactive pain points, information architecture, performance and, ultimately, recommendations. Starting the process by reviewing the website, combining a heuristic (practical) evaluation approach and cognitive walkthrough, essentially testing the solution by completing the most important user tasks on the site, evaluating the journey as they go. ¶ From user experience practices to usability issues, and gives specific expert recommendations for improvement. ¶ As a part of the optimisation process, this audit focused primarily on answering the following questions: 1. How well and how quickly can key tasks be completed on this website? 2. Are commonly used navigation principles adequately applied? 3. Is the structure of the site understandable? 4. Are help and error messages clear? Things to keep in mind before you proceed: • The user experience is everything. • Consistency among devices is key, but consistent doesn’t mean the same. • Working on mobile- first approach helps every next step of applying this design to a mobile app or desktop site. This is one of these opportunities. • There are many little details hidden in the following design choices. Nothing was left random. • Feel free to ask any question. Dear visitors, please fasten your seatbelts and secure all other links under your tabs or in the overhead bookmarks menu. Please turn ON all personal electronic devices (preferably mobiles), sit back, relax and enjoy your flight.